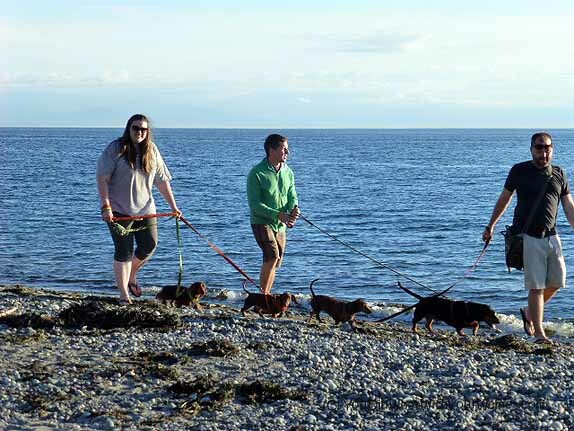 For those of you who don’t know, I organize the biggest Dachshund activity club in Seattle – the Adventurewiener Club. Our activities include hiking, dog park play dates, local pet events and the like. Now we can add “camping” to our list. I organized a camping trip to Deception Pass State Park, located a couple of hours north of Seattle. This was my first experience organizing a group camping event with dogs. I’ve been camping on my own, or with a couple of people, many times before but I didn’t really know what to expect when a bunch of dogs where thrown into the mix. I knew this would be a learning experience. I kept the group number low so things would be more manageable. About 10 people came with 13 Dachshunds total. The camping trip was fun overall but I certainly learned some things and there are several things I would do different next time. Whether you are planning to go camping with a few friends and their dogs or a larger group like ours was, these tips to help you have a more enjoyable time. Call the campground before you go with a big group to verify how many tents are allowed and will fit on the site, or sites, you reserved or are planning to use – State Parks in Washington require reservations and the website led me to believe that 8 tents would fit between the two sites we reserved. However, when we arrived there were only 4 good tent spots and 2 marginal ones. We made it work but it wasn’t ideal. We might not have been so lucky at some campsites. Don’t pick a campsite in a high traffic area – Our site was about 3 feet from the road and on a busy corner. This meant that people were walking, and kids were riding their bikes, past us all of the time…which led to “intruder” barking pretty frequently. In my experience, most State Parks campgrounds are VERY popular and crowded. Reservations can start to fill up a year in advance. Next time I will remember to make a reservation earlier so I can choose a campsite a little more out of the way. When camping in a large group, potluck-style meals are great – Everyone can chip in, you only need to set up one or two stoves and everyone can eat at the same time instead of waiting for their turn to make their food. Remember that not everyone on the trip may be comfortable with alcohol – If alcohol is allowed in the campground there are two ways to approach the issue respectfully. Either make it a dry camp or make it known that alcohol is allowed but only in moderation. If someone doesn’t follow the rules, they won’t be allowed to attend future camping trips (make that known up-front too). If you are the organizer, sleep in your own tent – Because of the space issue, I shared a tent with my friend. That would have been ok but every time she got up, or our dogs moved around, the crinkly floor or tent zipper woke me up. Good sleep is extra important for the event organizer. It’s also nice to have your own space to retreat too. Bring earplugs – As the group organizer I wouldn’t be comfortable wearing them myself. I feel a responsibility to monitor what goes on with our group at all times to head-off any potential problems…and that includes in the middle of the night. However, I would suggest ear plugs to other people in our group so that they can make sure they get a good nights sleep. Besides potential issues with our own group, there were hundreds of potentially obnoxious campers, screaming children and barking dogs at the campground. Mornings are much more pleasant if everyone is rested. 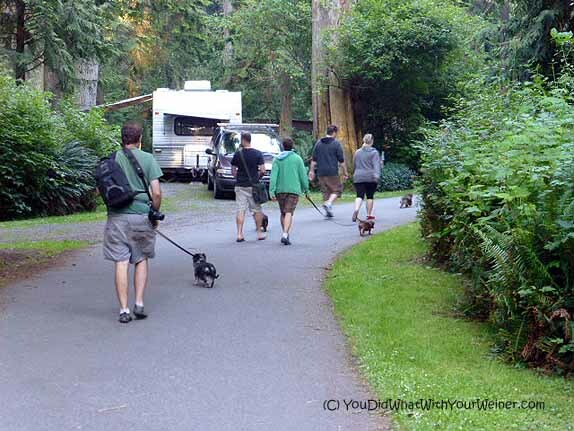 Take the dogs for a walk several times a day but especially right before bed – A tired dog is less likely to react to every little sound in the campground and sleep through the night. Have you ever camped with a large group that included dogs? Do you have any tips to ad? If you haven’t, do you have any other questions? I didn’t know about your involvement with an activity club–how neat! What a fun sounding trip! Good job on coordinating it! Great tips and pics! It was my first time coordinating a group camping trip. I am planning on making it an annual thing for us….with these lessons learned of course 🙂 We hike, do monthly walk in our local park (up to 70 Doxies attend) and do other fun things too. Looks like a fun trip! My idea of camping is staying at a cabin with no wi/fi, though, so I doubt I’ll ever use these tips. You didn’t even mention that S’mores are totally necessary for a successful camping trip! What a great trip! We went camping last week with only one dog, and found plenty of issues with dogs and obnoxious campers even though we were off the beaten track. Great tips! That sounds like so much fun! Wish we didn’t live on the opposite side of the country! Me too. It would be so fun if you could be part of our club. This looks like so much fun! And your advice is solid. I would never have thought to bring ear plugs. When we camp with the dogs, we always make sure the tent is near water – a lake or a river. That really wears the dogs out, fetching sticks and swimming. It’s hard for me to physically sleep with ear plugs in…but it is hard for me to sleep with loud partiers next door too. Like I said, I didn’t wear them this time because I was the organizer but they have saved me several times before. That looks fun, noisy, but fun. I love posts where people tell me all the mistakes they made so that I don’t have to. We are thinking of organizing something like this later in the summer. My job will be to pass this along to the person who decides to head it. Ha, ha. Yes….I made a lot of mistakes 🙂 I hope these help your organizer and you guys have a great time. Wow – I admire your ambition in planning this. It looks like lots of fun and a great place to camp. Good tips for those ready to tackle this. Oh, I just love camping! We love camping in State Parks because they allow dogs and because they do provide great amenities (ok, not all of the parks but most!). But yes…State Parks have a limit to how many tents can be on a campsite so if you are going in a large group, call ahead. The last trip we went on we were on a high traffic campsite and my “intruder alert button” got stuck on bark, even though I was exhausted from all the hiking. We do enjoy the “less traveled” side of a campground. I bet next time, your group trip will be a blast!! Live and learn, I say…especially when it comes to camping! I knew there was a limit on tents. There always are in campgrounds (at least Forest Service, National Parks and State Parks in Washington). The problem was that they said the limit was 8 tents between the two sites and when we got there we couldn’t fit 8 tents. What was listed on the website was wrong. I didn’t think to call ahead to make sure their information was accurate. I suspect even if I had called the reservation like would have “confirmed” by checking again on the website (the reservation centers are statewide and do not know camp spots intimately). I would probably try to call next time anyway and then make the assumption that we could fit 2 tents less than they listed. Lesson learned. I like that 13 Dachshunds is “keeping the group number low”, lol. We could never do this with a large group because my two would be too overwhelmed by all the people. They’re okay with other dogs, but not too many at once. I respect and admire you for organizing this… it would admittedly stress me way out! Great photos, though! What a beautiful area! I have had enough experience with our group to be reasonably sure that all of the Dachshunds get along with each other and pretty much all people. I would not attempt such a feat if I wasn’t pretty sure of that. Still, it is good to keep in mind. We did have a couple of dogs with us we had never met and it could have turned out that they didn’t get along with some of the other dogs in the group. There is no real “off season” here for our State Parks. It is typical to have to make a reservation at least 6 months in advance and even when there are last-minute camp spots available, there are only a few. We have such mild temperatures that tourists come year-round. There is definitely more appropriate campgrounds for barky dogs though 🙂 It’s just going to take some work to find them. Interestingly enough, we don’t have watershed management districts. That kind of thing was a discussion a few years ago in the water quality management community….mostly in respect to the control of mosquito and West Nile Virus. We have one huge watershed area here that protects our drinking water supply. They are VERY particular about what happens on that land. There MAY be some campsites though. I have an amazing campground in mind for next year but may need to get more resourceful in the future if we want to move around the State. Yes, a trailer would take care a lot of the problem. For us, I would argue that it’s not camping unless you stay in a tent though 🙂 Plus, I could never afford a trailer. Maybe I can find a friend with one. Ha, ha. Wow, you’re brave. But it sounds like a great trip. And you learned a lot of tips for the future. Could you use a couple more suggestions? When we go camping, we take a drive around to find the best campsites for the future. We write them down so we can reserve them next time. We also like camping during the shoulder season because it’s quieter. October might be a big nippy for short haired dogs. But even September is quieter than July. Those are good suggestions Pamela. Unfortunately, at this campground there are no “better spots”. The campground is very popular, very crowded and the sites are all crammed close together. 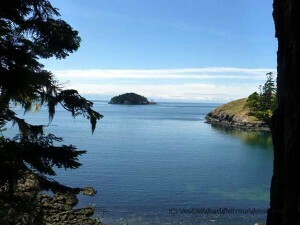 All sites as this campground are designated poor in privacy and high in traffic. I have drove around to pick better campsites before but it’s not an option at this campground. As I told Gizmo, there is no shoulder season for our State Parks really. Most of our campgrounds aren’t open mid-winter and reservations fill up 6 – 8 months in advance even in shoulder season. We get a lot of tourists here who bring RVs so they don’t mind the chillier weather. I know the perfect camp spot of us next year. That will give me two years to find another if we decide that we want to go to a new place the next time. What a fun idea, glad your event turned out good! I enjoy camping, but after taking both Sawyer and Bentley one time I decided it is better to just take one dog. Sawyer loves to go camping so he wins the lottery every time! And, yes, the barking instinct is something to deal with 🙂 I can’t wait to hear about your next camp out! Wow. 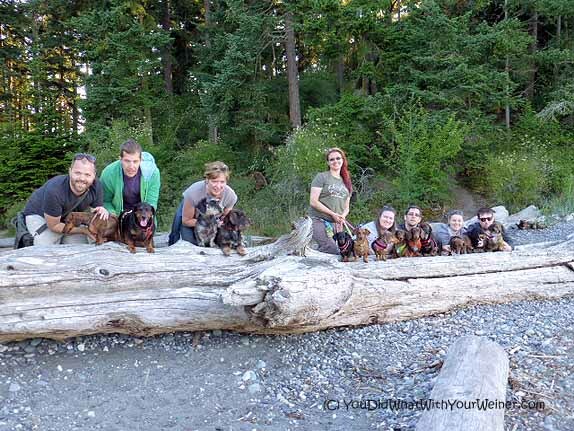 13 doxies! Looks like a gorgeous place and definitely sounds like an adventure! Sounds like quite the trip. I’m sure it was a total blast. I wanted to say, I think the moo mini cards I mentioned seeing at BlogPaws were actually yours! Wow! That would be a project organizing a camping trip like that. I would most likely howl on and off all night, love to hear myself howl when I am in a strange place. I bet it was fun, though, for sure the hiking part. Congratulations, Jessica Rhae. It looks like everyone had fun on this camping trip. What a fun trip – I’d love to go on something like that, but I think I’d just like to attend, organizing sounds like a LOT of work!